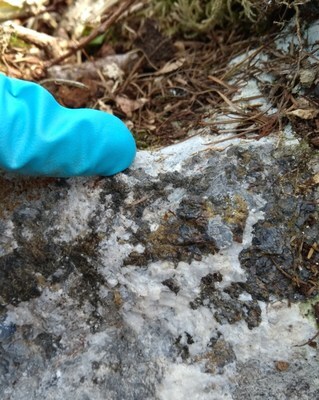 VANCOUVER, May 7, 2018 /CNW/ - Hannan Metals Limited ("Hannan" or the "Company") (TSX.V: HAN) (OTCPK: HANNF) is pleased to announce discovery of new lead and zinc mineralization in outcrop approximately 600 metres north from the Company's Kilbricken zinc-lead-silver resource in County Clare, Ireland. Mr Michael Hudson, Chairman & CEO states, "It is extremely uncommon to find outcropping mineralization in Ireland. Most surface occurrences were located during Victorian times, and it was only a recent forest clearing program which allowed our geologists to make this promising new discovery at Finanagh. 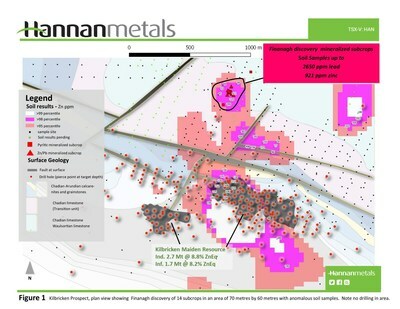 To highlight the potential significance of this find, Hannan's Kilbricken deposit was first discovered in 2008 when a private Irish exploration company drilled beneath similar galena, sphalerite and calcite veined shelf carbonates at a small Victorian-era lead mine. 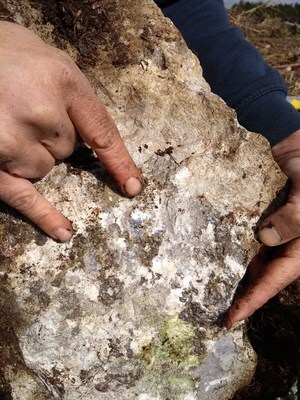 The discovery hole, DH04, intersected 10 metres @ 13.8% zinc, 5.5% lead and 62.8g/t silver from 448.1 metres depth." "All large Irish base metal mines are known to be comprised of clusters of individual deposits. At Kilbricken two such deposits have thus far been drilled, and a discovery like this in outcrop delivers great encouragement that many additional deposits remain to be found in close proximity. Along with the many high-quality targets identified by the recent seismic survey, we look forward to drill testing the Finanagh outcrop discovery when drill rigs return to the project this summer." Hannan's geologists were encouraged to undertake soil sampling at Finanagh to test positive features recognized in the recent seismic structural re-interpretation. This discovery of extremely high lead (up to 2,650ppm) and zinc (up to 921ppm) values in soil samples subsequently led to the discovery of sub-cropping mineralization in a recently deforested area. The discovery consists of 14 subcrops across 70 metres by 60 metres where mineralization is hosted by fine grained limestone with veins and disseminated coarse galena and sphalerite. Pyrite is present as an accessory sulphide (Photos 1 and 2). 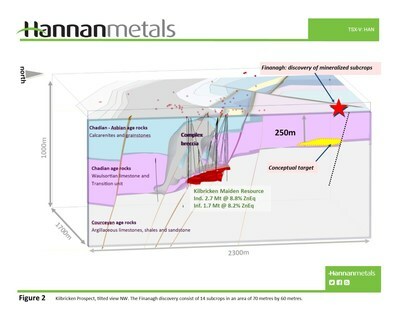 The new discovery at Finanagh is part of the 12 kilometres of strike potential around Kilbricken, within which it presents a priority drill target due to the combined presence of highly anomalous soil samples, mapped structure and outcropping mineralization. The area has not previously been drill tested, and it is interpreted that the potentially mineralized host rock position (Waulsortian Limestone) will lie at shallower depths (250 metres) than at Kilbricken (Figure 2).